One more recipe for the cookbook challenge. 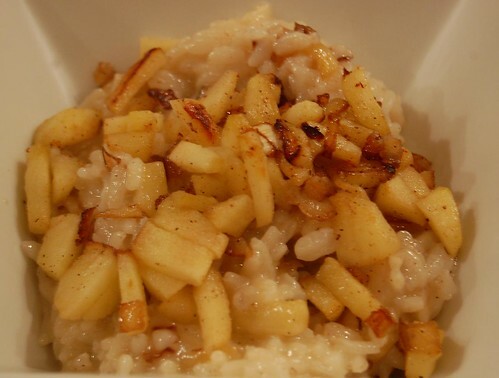 I had just one question about this: would it be as good as Rossella’s fabulous pear and gorgonzola risotto? Answer: not quite. It’s a plain risotto with gorgonzola and parmesan melted into it and a garnish of fried onions and apples. We felt there wasn’t really enough gorgonzola, but I liked the slight crunch of the apples in contrast to the creamy rice. Nicky managed to take a presentable photo of hers; I tried, but I can’t say the same. Well, I’ve already established that risotto is not photogenic!